An anatomical illustration from the 1921 German edition of Anatomie des Menschen: ein Lehrbuch für Studierende und Ärzte with Latin terminology. The earliest suggested examples were once thought to include the Proto-Neolithic Homo sapiens component (ninth millennium BC) from Shanidar Cave in Iraq, and Neolithic peoples in Southwest Asia. In the Old World, Huns also are known to have practised similar cranial deformation, as were the people known as the Alans. In Late Antiquity (AD 300–600), the East Germanic tribes who were ruled by the Huns, the Gepids, Ostrogoths, Heruli, Rugii, and Burgundians adopted this custom. Among the Lombards, the Burgundians and the Thuringians, this custom seems to have comprised women only. In western Germanic tribes, artificial skull deformations rarely have been found. The practice of cranial deformation was brought to Bactria and Sogdiana by the tribes who created the Kushan Empire. Men with such skulls are depicted in various surviving sculptures and friezes of that time, such as the Kushan prince of Khalchayan. In the Americas, the Maya, Inca, and certain tribes of North American natives performed the custom. In North America the practice was known, especially among the Chinookan tribes of the Northwest and the Choctaw of the Southeast. 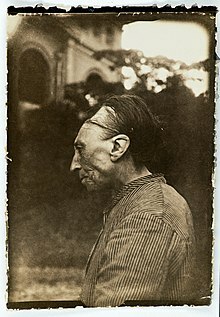 The Native American group known as the Flathead Indians, in fact, did not practise head flattening, but were named as such in contrast to other Salishan people who used skull modification to make the head appear rounder. Other tribes, including both Southeastern tribes like the Choctaw and Northwestern tribes like the Chehalis and Nooksack Indians, practiced head flattening by strapping the infant's head to a cradleboard. In Africa, the Mangbetu stood out to European explorers because of their elongated heads. Traditionally, babies' heads were wrapped tightly with cloth in order to give them this distinctive appearance. The practice began dying out in the 1950s. Dr. Leopold Müller: Lithography of a fetus, in the intrauterine position, with the typical Huanca skull shape (Lamina VI a.) in the Spanish version of the 'Peruvian Antiquities' (1851) which was found in a mummy of a pregnant woman. Historically, there have been a number of various theories regarding the motivations for these practices. the same formation [i.e. absence of the signs of artificial pressure] of the head presents itself in children yet unborn; and of this truth we have had convincing proof in the sight of a foetus, enclosed in the womb of a mummy of a pregnant woman, which we found in a cave of Huichay, two leagues from Tarma, and which is, at this moment, in our collection. Professor D’Outrepont, of great Celebrity in the department of obstetrics, has assured us that the foetus is one of seven months’ age. It belongs, according to a very clearly defined formation of the cranium, to the tribe of the Huancas. We present the reader with a drawing of this conclusive and interesting proof in opposition to the advocates of mechanical action as the sole and exclusive cause of the phrenological form of the Peruvian race. It will be manifest from the general contour of these skulls that they are allied to those in the Museum of the College of Surgeons in London, denominated Titicacans. Those adult skulls are very generally considered to be distorted by the effects of pressure; but in opposition to this opinion Dr. Graves has stated, that "a careful examination of them has convinced him that their peculiar shape cannot be owing to artificial pressure;" and to corroborate this view, we may remark that the peculiarities are as great in the child as in the adult, and indeed more in the younger than in the elder of the two specimens now produced: and the position is considerably strengthened by the great relative length of the large bones of the cranium; by the direction of the plane of the occipital bone, which is not forced upwards, but occupies a place in the under part of the skull; by the further absence of marks of pressure, there being no elevation of the vertex nor projection of either side; and by the fact of there being no instrument nor mechanical contrivance suited to produce such an alteration of form (as these skulls present) found in connexion with them. ^ a b Meiklejohn, Christopher; Anagnostis Agelarakis; Peter A. Akkermans; Philip E.L. Smith & Ralph Solecki (1992) "Artificial cranial deformation in the Proto-Neolithic and Neolithic Near East and its possible origin: evidence from four sites," Paléorient 18(2), pp. 83-97, see , accessed 1 August 2015. ^ Trinkaus, Erik (April 1982). "Artificial Cranial Deformation in the Shanidar 1 and 5 Neandertals". Current Anthropology. 23 (2): 198–199. doi:10.1086/202808. JSTOR 2742361. ^ Agelarakis, A. (1993). "The Shanidar Cave Proto-Neolithic Human Population: Aspects of Demography and Paleopathology". Human Evolution. 8 (4): 235–253. doi:10.1007/bf02438114. ^ Hippocrates of Cos (1923) [ca. 400 BC] Airs, Waters, and Places, Part 14, e.g., Loeb Classic Library Vol. 147, pp. 110–111 (W. H. S. Jones, transl., DOI: 10.4159/DLCL.hippocrates_cos-airs_waters_places.1923, see . Alternatively, the Adams 1849 and subsequent English editions (e.g., 1891), The Genuine Works of Hippocrates (Francis Adams, transl. ), New York, NY, USA: William Wood, at the [MIT] Internet Classics Archive (Daniel C. Stevenson, compiler), see . Alternatively, the Clifton 1752 English editions, "Hippocrates Upon Air, Water, and Situation; Upon Epidemical Diseases; and Upon Prognosticks, In Acute Cases especially. To which is added…" Second edition, pp. 22-23 (Francis Clifton, transl. ), London, GBR: John Whiston and Benj. White; and Lockyer Davis, see . All web versions accessed 1 August 2015. ^ Bachrach, Bernard S. (1973) A History of the Alans in the West: From Their First Appearance in the Sources of Classical Antiquity Through the Early Middle Ages, pp. 67-69, Minneapolis, MN, USA: University of Minnesota Press. ^ Herbert Schutz, The Germanic Realms in Pre-Carolingian Central Europe, 400-750, P. Lang, 2000, p. 62. ^ Tore Ahlbäck, The Problem of Ritual, Donner Institute, 1993, p. 279. ^ Pany, Doris & Karin Wiltschke-Schrotta, "Artificial cranial deformation in a migration period burial of Schwarzenbach, Lower Austria," ViaVIAS, no. 2, pp. 18-23, Vienna, AUT: Vienna Institute for Archaeological Science. ^ Tiesler, Vera (Autonomous University of Yucatan) (1999). Head Shaping and Dental Decoration Among the Ancient Maya: Archeological and Cultural Aspects (PDF). 64th Meeting of the Society of American Archaeology. Chicago, IL, USA. pp. 1–6. Retrieved 1 August 2015. ^ Tiesler, Vera (2012). "Studying cranial vault modifications in ancient Mesoamerica". Journal of Anthropological Sciences. 90: 1–26. ^ Tiesler, Vera & Ruth Benítez (2001). "Head shaping and dental decoration: Two biocultural attributes of cultural integration and social distinction among the Ancient Maya," American Journal of Physical Anthropology, Annual Meeting Supplement, 32, p. 149". ^ Elliott Shaw, 2015, "Choctaw Religion," at Overview Of World Religions, Carlisle, CMA, GBR: University of Cumbria Department of Religion and Ethics, see , accessed 1 August 2015. ^ Hudson, Charles (1976). The Southeastern Indians. University of Tennessee Press. p. 31. ^ Schaffer, W. C.; Carr, R. S.; Day, J. S.; Pateman, M. P. (2010). "Lucayan–Taíno burials from Preacher's cave, Eleuthera, Bahamas - Schaffer". International Journal of Osteoarchaeology. 22: 45–69. doi:10.1002/oa.1180. ^ Ratzel, Friedrich (1896). "The History of Mankind". MacMillan, London. Archived from the original on 6 July 2011. Retrieved 4 October 2009. ^ Delaire, MMJ; Billet, J (1964). "Considérations sur les déformations crâniennes intentionnelles". Rev Stomatol. 69: 535–541. ^ Janot, F; Strazielle, C; Awazu Pereira, Da Silva; Cussenot, O (1993). "Adaptation of facial architecture in the Toulouse deformity". Surgical and Radiologic Anatomy. 15: 1038. doi:10.1007/BF01629867. ^ a b c d Eric John Dingwall, Eric John (1931) "Later artificial cranial deformation in Europe (Ch. 2)," in Artificial Cranial Deformation: A Contribution to the Study of Ethnic Mutilations, pp. 46-80, London, GBR:Bale, Sons & Danielsson, see "Chapter 2" (PDF). Archived from the original (PDF) on 2014-09-12. Retrieved 2014-02-20. [page needed] and [page needed], both accessed 1 August 2015. ^ Colin Barras (13 October 2014). "Why early humans reshaped their children's skulls". BBC Earth. Retrieved 15 May 2015. ^ Mariano Eduardo Rivero, Juan Diego de Tschudi: Antigüedades Peruanas. Textband. Imprenta Imperial de la Corte y de Estado, Viena 1851, (Digitalisat). ^ Rivero and Tschudi (1852) Antigüedades peruanas (Peruvian Antiquities), issue 1851/1852. ^ Bellamy, P. F. (1842) "A brief Account of two Peruvian Mummies in the Museum of the Devon and Cornwall Natural History Society, in Annals and Magazine of Natural History, X (October). ^ P. F. Bellamy: A brief Account of two Peruvian Mummies in the Museum of the Devon and Cornwall Natural History Society. In: The Annals and Magazine of Natural History. Bd. 10, No. 63, 1842, p. 95–100. ^ Martin Frieß; Michel Baylac (2003). "Exploring artificial cranial deformation using elliptic Fourier analysis of procrustes aligned outlines". American Journal of Physical Anthropology. 122 (1): 11–22. doi:10.1002/ajpa.10286. PMID 12923900. Adebonojo, F. O. (1991). "Infant head shaping". J. Am. Med. Assoc. 265: 1179.